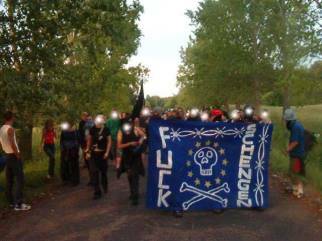 04.Jul.03 - The fourth anti-border camp in Poland has finished. 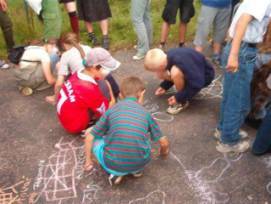 (Previous camps were held in 2000 in Utrzyki Gorne (on the border with Ukraine and Slovakia), in 2001 in Krynki (on the border with Belarus) and in 2002 in Wizajny (on the border with Lithuania and Russia).) Perhaps a total of 200 people passed through the camp or different events; typically there were between 100-150 people at the camp. There were activists from Poland, Russia, Belarus, Brazil, Finland, Portugal, Spain, France, Belgium, Germany, Romania, Sweden, USA, Canada, Czech, Israel and some other countries there. The camp was kicked off with anti-border concert in DeCentrum squat in Bia?ystok July 2st entitled "Music against Borders". In general, although the number of people at the camp was relatively small, most people considered it quite successful. The camp followed several days on intensive activism in Warsaw where a number of conferences and meetings were held. Some meetings and workshops and film screenings on various topics related to migration and No Border activities took place. Activists from many countries were able to come and network. Unfortunately there was almost no local interest in these events on the part of the general public. On June 30, a demonstration took place. It started at the Stadium which is home to Europe�s largest open-air market. Thousands of people, in particular small traders from many Eastern countries (former Soviet Union, China, Vietnam), make a living there, many with cross-border trade. The market is under constant pressure from border police and cops enforcing anti-piracy and anti-peddling laws and city officials would like to gentrify the area. (They currently just simply cannot find enough investors to carry out all their gentrification plans.) The demo moved over Warsaw�s main bridge in defiance of the police and headed to the Ministry of Foreign Affairs. Unfortunately there were a few tactical errors and people were arrested before we got there. People were released in a few hours with fines of 11 euros. Despite not making it all the way, the demo was fairly successful in that many people saw it and there was rather positive response in the press. A picket scheduled for July 1 at the Ministry responsible for refugees met with some unforeseen complications. 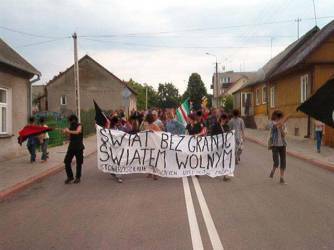 On July 2, a demo was held in Bialystok against current border politics. 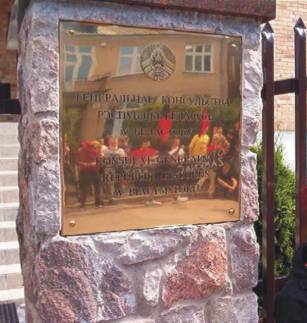 Besides visiting some local bureaucrats, the demo also stopped at the Belarussian Consulate. There was a small speech made about how Belarus was cooperating with the IOM by planning to open detention centers in Brest and at Minsk-II airport; the center in Brest would deal particularly with people caught on the super-fortified Polish border. Also people protested the treatment of the press and human rights abuses in that country. After the demo, people moved on to the camp. During the camp, a number of talks and meetings with the public took place. Most of it was very laid-back. 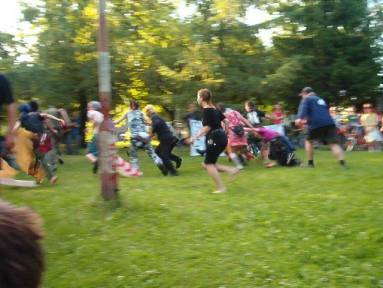 Visits were made to Wizajny as well to renew contact with the locals met during last year�s camp. 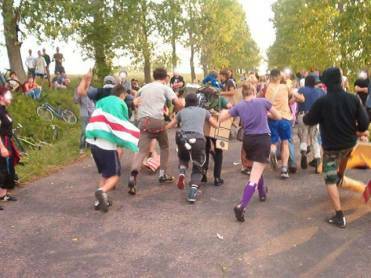 On July 4, a group of people from the camp crashed a reception during the �American Days� Festival in Bialystok, shouting anti-war slogans for 15 minutes before the cops showed up and ascorted them away. On the 5th, a small event was held in the local park. 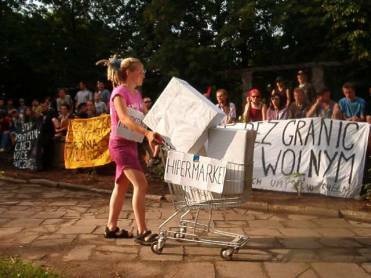 Some street theater events took place, one prepared by people from Bialystok which showed the connection between border politics and other political issues very well. 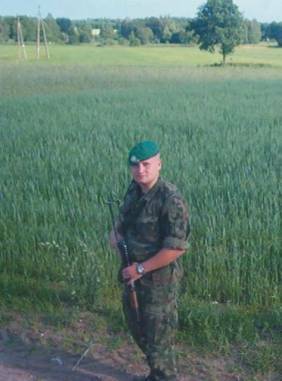 Afterwards a demonstration to the border took place. It was accompanied by many locals, particularly children and passed without incident. On the border a speech was made about the problems and the fate of Chechen refugees in Poland and a few theatre pieces were made, including one prepared by people from Chelm (near the border with Ukraine) which illustrated the racist and classist assumption used in visa processes. At the end of the camp, some ideas were given for the continuation of campaigns later this year and next.